The overture recounts the magical re-awakening of spring’s arrival in Sweden. After a long and dark winter, creatures great and small join Swedes desperately longing for the first rays of warming sunshine. A melancholic, haunting song is first heard from afar (När som jag var på mitt adertonde år – ‘As I was on my 18th year’). Various instruments from different locations in the concert hall are echoing the solitary female voice. 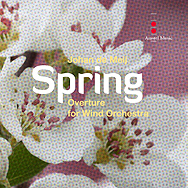 The aching, soulful melody gradually transforms to a polka-like variant that builds to the joyful, optimistic Spring main theme. Creatures venture out from a long hibernation, people emerge from their homes to celebrate, and the main theme converts again into an even more jubilant, fast dance-like scene. At this point, another well-known Swedish folksong appears as a counter melody (Ack Värmeland du sköna – ‘Oh Värmland Thou Art Beautiful’) thematically supporting the giddy celebrants. It is first introduced by a brass quartet (2 cornets, alto horn & euphonium) and crescendos into the full, satisfying sounds of complete brass choir. * Plastic hose: available in every toyshop. Swing around in the air to create sound; with a faster spin, the pitch will go up.